2001 was the beginning of a Renaissance for the Type I format. After half a decade of slow decline, tournament interest and enthusiasm surged, as players organized tournaments online, in Europe, and as Origins and GenCon became major Type I tournament scenes. Witness the rise and fall of Accelerated Blue, the dominance of Fact or Fiction, and the emergence of the first Welder-based Workshop decks, Gush strategies, Sapphire Oath, and much, much more! 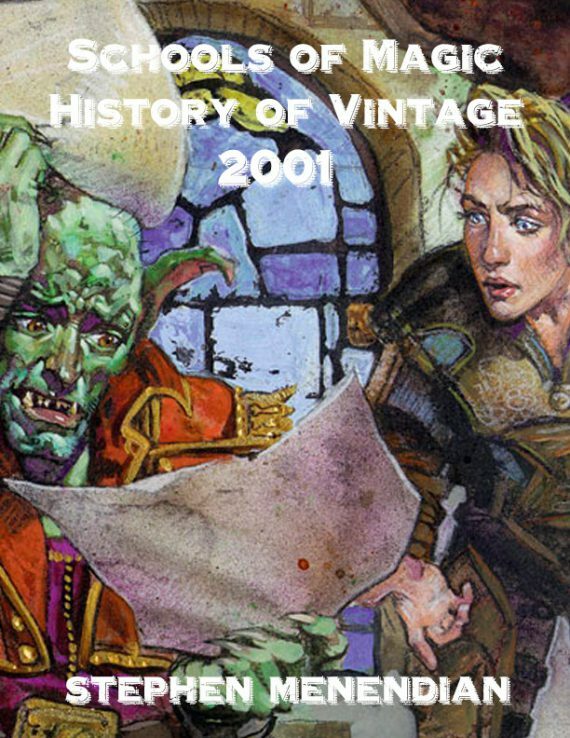 Rediscover long-lost decklists and tournament report excerpts that capture the feeling and experience of the format in 2001. Revisit the debates between players like Tom LaPille, Oscar Tan, and Matt Smith, and learn history’s judgment of their arguments. Continuing Stephen Menendian’s epic History of Vintage series, Chapter 9 (2001) is a dramatic turning point in the history of the format. At 30 pages of action-packed history, this chapter is not to be missed! After years of malaise and slow decline, the Type I format seemed to be turning a corner as 2000 drew to a close. With the schism of formats and the institution of the Reserved List years earlier, Wizards of the Coast and tournament organizers deliberately withdrew support from Type I by shifting their emphasis to Type II, and, later, other formats. Wizards managed the format’s Banned and Restricted List and sponsored an annual Type I Championship at Andcon every fall, but that was about the extent of their support. The format was treated more as a Barnum curiosity than a legitimate vehicle for experiencing the game of Magic. Wizards gave Type I critical visibility as a regular format on the Magic Invitational, a token gesture that underscored rather than reduced its marginalized status. It is not surprising that local tournament support and interest in Type I continued to dwindle over the second half of the decade. Inquest magazine, fighting this trend, saw an opportunity and sponsored a $50K tournament series in the summer and fall of 1997 with disappointing results and turnout. Like a big budget movie that bombed at the box office, there would be no sequel. It was a valiant, but failed experiment. 1999 was the nadir of the format’s long decline. It was not much of an exaggeration to refer to the format as “dead.” Wizards’ support was in name only. The Type I Championship at Andcon (organized by Andon Unlimited) had been discontinued, organized Type I tournaments had dried up, and Urza’s block shattered the format’s reputation and status quo by precipitating three separate waves of restrictions. Despite this, green shoots were visible in the deadened environment. For the first time in many years, excitement and enthusiasm for the format was palpable. Player interest and passion had been focused and channeled through the platform of Beyond Dominia, which gave a voice and outlet for Type I discussion and debate. The format had been carefully sculpted by DCI intervention, and the Type I format that appeared in the fall of 2000, after the restriction of Necropotence, was once again attractive to many players. Combo had been successfully neutered, and not only were control decks once again top tier, but aggro decks had re-emerged as well. If the metagame of the November 2000 Invitational was any indication, Type I was about to enter a Renaissance of sorts. Players were clamoring for tournaments, and tournament organizers seemed more willing to oblige. Neutral Ground was hosting regular Type I tournaments in New York, and Trader Online was hosting even larger monthly tournaments in Germany, called the Dülmen. Even more prominent tournaments were about to launch online for the first time. 2001 would be the first year that community led and organized tournaments were created with an eager, global player base seeking out the Type I experience. The carefully tended format was becoming a control pilot’s dream. With Keeper decks seemingly ascendant based on their performance on the Magic Invitational, and with Necropotence now a victim of restriction, adherents of the Weissman School believed they had entered the promised land after several years in exile. By the end of the year, they would awaken from a blue nightmare that would prompt, yet again, more restrictions. Discussion, debate, and deck advice was not enough to satisfy the intense player interest evident on Beyond Dominia. The advent of online Magic platforms such as Wizards of the Coast’s Magic Encyclopedia and Dragonstar Studio’s free Apprentice made it possible to use the Internet to test and play Type I games. This opened up the possibility of not only free match play, but Type I tournaments organized online. This possibility was seized by the staff at Bdominia, and the first Tournament of Champions was organized. Players submitted their decklists in advance to the tournament organizer, which would be kept secret until after the tournament had begun. Randomized Swiss-style pairings would be announced on the forum at roughly a rate of one round every few days (faster than correspondence chess, but slower than real tournaments). Players were expected to contact each other and arrange a time to play their match, and were also expected to report their results and write up a summary of each round. The first such tournament kicked off in the final months of 2000, by the end of the year the winner of the first Tournament of Champions had been crowned. Canadian Michael Bower’s Mono Blue Ophidian Control deck not only took down the inaugural Tournament of Champions, but took many Bdominia regulars by surprise. Mono Blue Control had arrived in Type I.
Bower took his cue from Zvi Mowshowitz’ Mono Blue Control deck from the first 2000 Magic Invitational, which was the only deck in that portion of that tournament to go 3-0. Both decks eschewed the typical preference for multi-color control in favor of a far more streamlined archetype. Both decks are anchored by Ophidian, one of the best card drawing engines of the era. Both decks also featured a high density of countermagic. Mike Bower ran more Misdirections than Zvi (who ran none), but lacked the more efficient countermagic like Mana Leak, and eschewed Impulse and Brainstorm that Zvi’s deck included. One of the most important innovations here was the incorporation of a full complement of Powder Keg, to clear out Jackal Pup-level threats and remove Moxen as well. Back to Basics out of the sideboard would lock up and lock out any multi-color control opponent. Soothsaying was an unusual and controversial card that was popular on Bdominia, but less popular among pros or players like Brian Weissman. Michael Bower’s performance would strike an important note and set the tone for 2001.